New Delhi : The government of India has decided to print 15 crore currency notes of Rs 1 every year with effect from January 1, 2015, as entitled under the provisions of the Coinage Act, Parliament was informed today. "Government has issued gazette notification dated December 15, 2014 to print Re.1 currency notes with effect from January 1, 2015, under the provisions of the Coinage Act," Minister of State for Finance Jayant Sinha told the Rajya Sabha in a written reply. The government has, thereby, decided to print 150 million one rupee notes per year, he said. The minister also informed the upper house that printing of Rs.1, 2 and 5 denomination notes were discontinued by the Reserve Bank of India because of the high cost of printing involved. "At present, there is no proposal to issue Rs.2 and 5 denomination notes," he added. Notable, recently on July 2 there was a shocking news about the note of Rs 1 that is, the cost of printing one rupee note is more than its value. 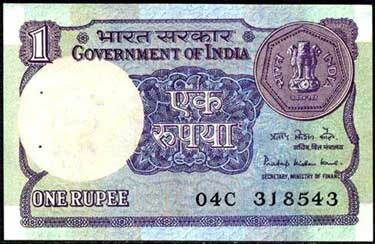 The cost of printing one rupee note is Rs 1.14.